Hero Histories: The Not-So-Jolly Green Giant! Pre-dating the "Ho-Ho-Ho-ing" frozen vegetable spokesman by over a decade, a radically-different, costumed, Green Giant appeared in (what else?) 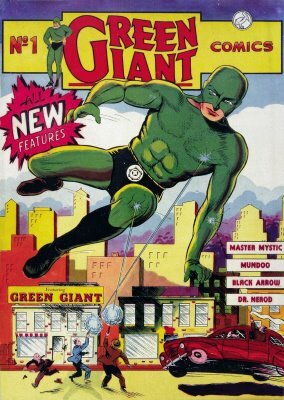 Green Giant Comics #1 (and only) in 1940! The emerald avenger was secretly Brent Wood, who beat Marvel's Henry Pym to developing a size-changing serum which enabled him to grow to between 15-150 feet (depending on who illustrated the story)! Less than a dozen copies of this incredibly-rare comic (distributed only in the New York City area, and now valued at several thousand dollars each) are believed to still exist! The Green Giant recently cameoed (in flashback) in Alex Ross' Project SuperPowers mini-series which revives Golden Age heroes in the present day. Hopefully, we'll see more of him in the on-going series. If you're looking for a retro-style graduation or birthday gift for a Golden Age of Comics fan in your life, why not bundle one of our Green Giant goodies with the Project SuperPowers trade paperback (or the original mini-series issues) for a kool, kollectible present?